I believe wholeheartedly in scrapbooking (although I haven’t worked on my own much lately). I’m not talking about those wildly decorated pages with one picture on them that took hours and lots of tools and supplies to create (although if you are a fan of those, more power to you…I have too many pictures and not enough patience). No, I just mean getting your pictures into a book of some kind (that is safe for the images if not a digitally created book) with the stories of your pictures written or typed out beside them. These are your memories, the recording of your life. That’s a story that deserves to be told. I was babysitting the other day for a dear friend of mine and after the boys went to bed, I pulled one of her scrapbooks off the bookshelf and started going though it. Her scrapbooks are meticulously lined up by year and she is almost caught up to current date. I went through the first one entirely before I even realized that she had little to no “decoration in it at all. It was just pictures and journaling in her own hand. I was so engrossed in the stories and the images that I did not miss the “pretty pages” at all. Guess what…your kids or grandkids won’t miss them either. Wouldn’t you love to have an organized history of your parents, grandparents, or even your own life with the stories in their own voice and their own hand? Talk about priceless. Don’t get bogged down in all the hype and “commercialism” of scrapbooking. Simple is good, often even better! I guarantee you that those two boys won’t ever say, ” I wish Momma had spent more time decorating these pages”! I think about these things all through the year, but a good part of the community joins me in it around this time of the year:). We are scheduling appointments now for portrait sessions with Santa. Boy have times changed! I remember going to see Santa every year when I was little. It was usually in this little storage type building that sat in the parking lot of the Kroger on Broadway, probably because that was the closest one near my Grandparents’ house. 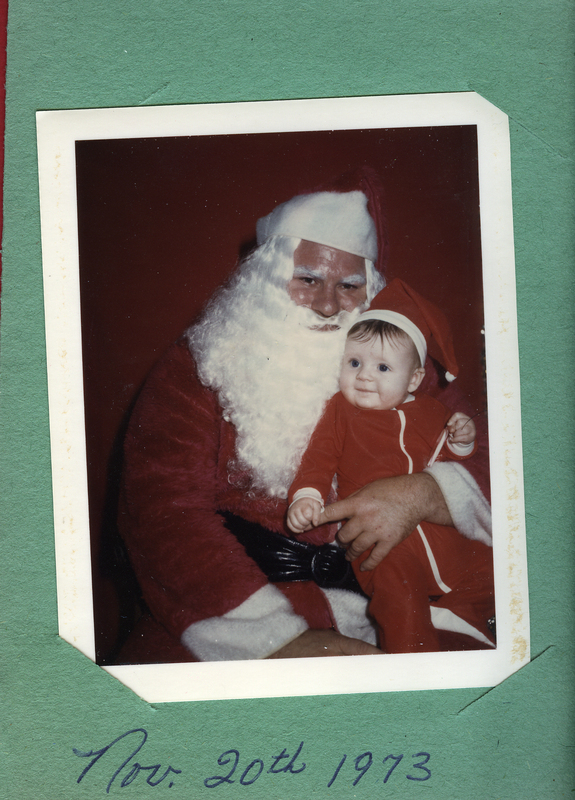 I don’t ever remember being scared of Santa, but then, I wasn’t exactly a “normal” child. Back then, you got a Polaroid picture and it was just one shot. I now have each one of these placed in their rightful chronological spot in my own childhood scrapbooks. I wouldn’t take anything for those pictures. Now we do 30 minute sessions with Santa and have at least 20 shots to show for it by the time we are through. More importantly, the kids get to actually spend some time with Santa, they usually end with reading a book together. Here at the lab, we work with a lot of professional photographers and their clients. The last three months of the year are tremendously popular in this area of the country for family photos, so things get a little more exciting right about now for that reason. It’s always a great feeling to know that we have helped produce something that will mean so much to families. I’m a techy girl and I like my gadgets (Iphone, IMac, IPad…I’m an Apple girl in case you hadn’t guessed), but they will never take the place of a good, old-fashioned, reliable print in my heart. Technology is a great addition, but not a replacement.